Phase Changing Material Based GADVASU Milk Chiller. The designed prototype is for chilling of 40 l of milk but capacity can be conveniently enhanced. 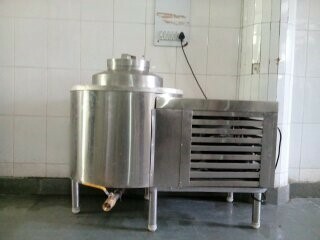 Machine is capable of maintaining the low temperature for more than 12 h.
Dr Amandeep Sharma, Assistant Professor (Dairy Engineering). Contact person for further information. Dr Amandeep Sharma, Assistant Professor, College of Dairy Science and Technology, GADVASU, Ludhiana – 141004. M/S Chada Sales Pvt. Ltd. 137-139 Rajindra Market, Tees Hazari Delhi, 11054.